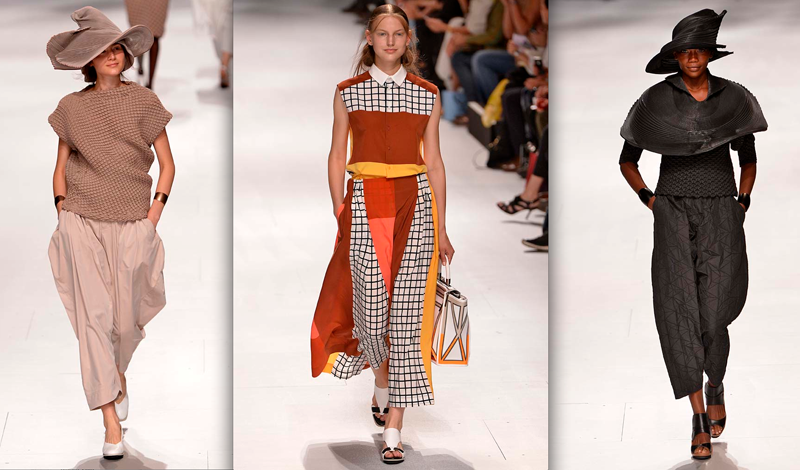 Sculptural chapeaus and equally architectural clothes ruled the Issey Miyake runway. Obviously there were high-tech fabrications and brilliant pleatings to faun over, from the clean, glow-inducing all-white opening looks to a nearly autumnal patterns and some wear-everywhere, all-black looks, plus a couple lovely pops of daffodil yellow and periwinkle. The clothing was set against a backdrop of balloons that went up and down in tune with the music by musician Ei Wada, who energetically played an organ throughout the show. Yoshiyuki Miyame always has an arty element going on behind his shows, but the clothes are equally artful. The detail on the hats and the elaborate shrugs was outstanding. Meanwhile, the gingham looks in combos of black, turquoise, white or rusty brown, mustard, black and white really caught the eye. Leave it to Miyame to take the ultra-American gingham look and transform it into wide leg pants with a slouchy suit jacket or a sun dress with more elongated checks. There was plenty to fawn over for Issey Miyake fans, who are always looking for something very unique, but still wearable.